Bernie and Tammy Jarriel are active members of the Montana Owner Club forum montanaowners.com that live in Seward year round in there Montana 5th wheel. 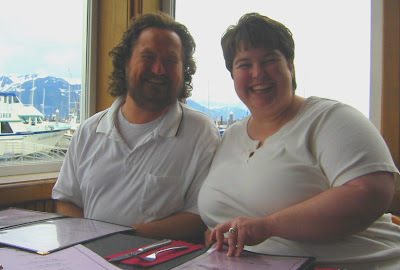 They have become the MOC Alaska Hospitality Committee; we are the 6th couple so far this summer to visit Seward and spend time with them, as they tell of living in a 5th wheel where the snow fall is almost as tall as your trailer. They had a wonderful table reserved for us at Ray’s on the wharf! It was great to meet them and swap “Montana” tales, though theirs are a lot more exciting! We can’t imagine driving their brand new Montana from the dealer in Anchorage down to Seward in JANUARY!! They have ice on those highways that time of the year! And then there was so much snow in their campground, it sounded like a roofless tunnel to back it into!! Thanks for such an enjoyable meal! Just as you enter Seward is the turn off to Exit Glacier. 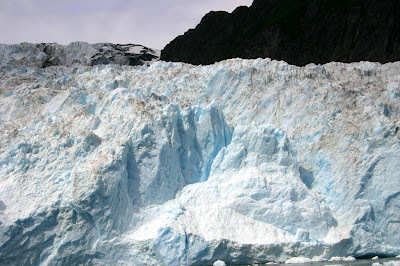 This is the only place where you can drive into the 670,000 acres Kenai Fjords National Park. 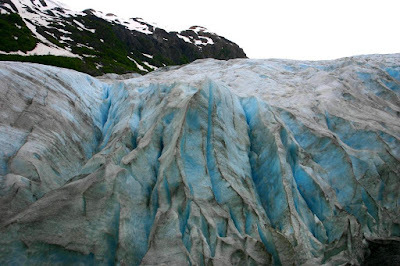 Exit Glacier is also one of the most accessible glaciers in all of Alaska. The walk from the parking lot to the edge of the glacier is only a 1 mile round trip. 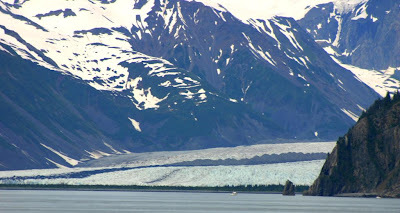 It is also the easiest place to get to the 300 square mile Harding Icefield that feeds all of the glaciers on the Kenai Peninsula. 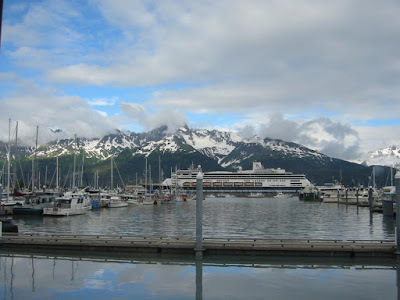 The Seward tourist industry includes cruise ships arriving and departing, fishing charters for halibut and salmon and boat tours of Kenai Fjords National Park. The boat tour industry is so big that everyday a passenger train of people comes down from Anchorage just for the boat tours. There are at least 4 different boat tour companies, most running several boats a day and tours are 3 hours, 6 hours and 8 hours. 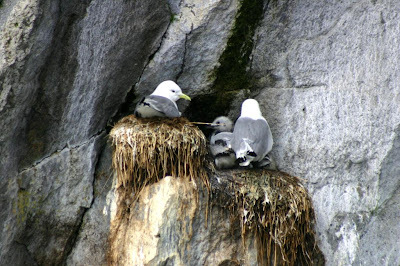 The very last day of our first Alaska trip 10 years ago we took a Kenai Fjords National Park Boat Tour. Even after 4 visits to Alaska and all of the great things we have done, I still think it is the single best tour in Alaska. This time we went on the Renown Tours catamaran. The seas were calm and the catamaran was very stable. We stayed outside the whole time until we started back to port. The whole trip was about 120 miles round trip and lasted exactly 6 hours. 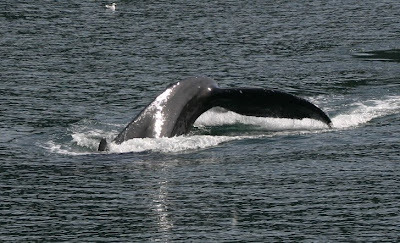 We saw sea otters, at least a half a dozen humpback whales, but no Orcas. We also saw 2 kinds of dolphins and 2 kinds of seals. We saw 15 species of birds including 2 new LIFE BIRDS: The Red-faced Cormorant and the Parakeet Auklet! The Captain even said that if there were Birders on board just tell the crew or the ranger if there is a target bird you want to see and they would try to get you to it. Both the Captain and the on board ranger were Birders. We saw mostly Black-legged Kittiwakes, Common Murres and Tuffed Puffins. We also saw some of the Horned Puffins and Glaucus Winged Gulls on the cliffs of the islands. 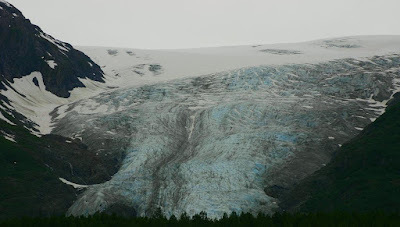 They take you to one glacier and depending on how they are doing on time they decide which one to take you to. 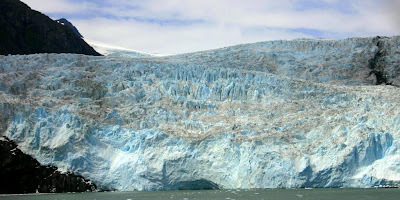 This trip we went to the Holgate Glacier. We did not see it caving this time, but we got pretty close to it that we could hear it cracking and groaning. Throughout the day the scenery was INCREDIBLE! The Alaska Sea Life Center is also in Seward, it was built with some of the money that Exxon was fined due to the infamous Exxon Valdez oil spill. The Center’s mission is to rehabilitee injured sea life and to educate the public about the sea life in the area. Since we were members of the Monetary Bay Aquarium for so many years and went so often everything pales by comparison, but it is impressive for a town this small. One huge bull Stellar Sea Lion knew how to work the crowds. 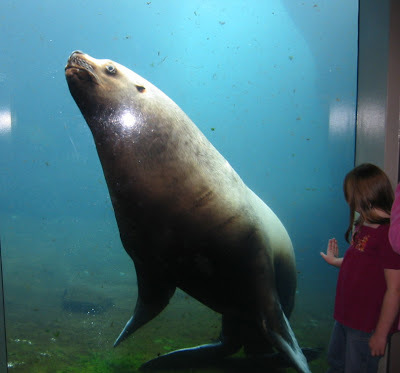 The tank is 3 stories tall, so you can go down below and see the seals and fish swim. This bull was right up to the window showing off. He even looked like he was trying to hug the little girls standing next to the window watching him. What a ham! One of the pictures in the slide show gives a good size perspective of this beast! They also had an aviary, which of course, we HAD to stop in first! 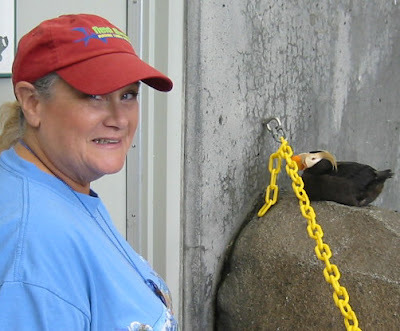 Imagine our delight to be able to go up to a Tufted Puffin as close as 12”! Puffins do bite we were warned, but they look so comical with those bright beaks! You could also go down below and watch the Common Murres and the Puffins swim under water. There was fish littered on the bottom of the pool for them to hunt for themselves. Quite impressive to see them “Fly” under water. Thanks for sharing the pictures and commentary. We visited here last March 2007. Loved it, loved it too. Yup, that big Sea Lion sure is a ham! A friend of mine goes by the name "Kenai" on-line; he was from Alaska before he moved to California. I had no idea he was named after a National Park. I'll make sure he gets a link to the slide show. I think he'll enjoy it.